After the huge success of the HYT H0 during Baselworld 2017, HYT presented the H0 'Feel the HYT' Edition during Watches & Wonders Miami 2018. Continuing with the saga of engraved casebands with exciting messages that enhance the primal curves of the pebble shaped case/crystal construction, the new HYT H0 ‘Time is Precious’ Edition is one of the latest pieces released by the Hydromechanical horologists during the SIHH 2019. Fitted with a multifaceted mirror dial that resembles a broken mirror and red fluidic hours, the HYT Time is Precious pays tribute to the phrase mastered by humanity for centuries regarding the priceless value of time. The new redesigned case really limits the use of metal and maximizes the size and shape of the sapphire crystal. 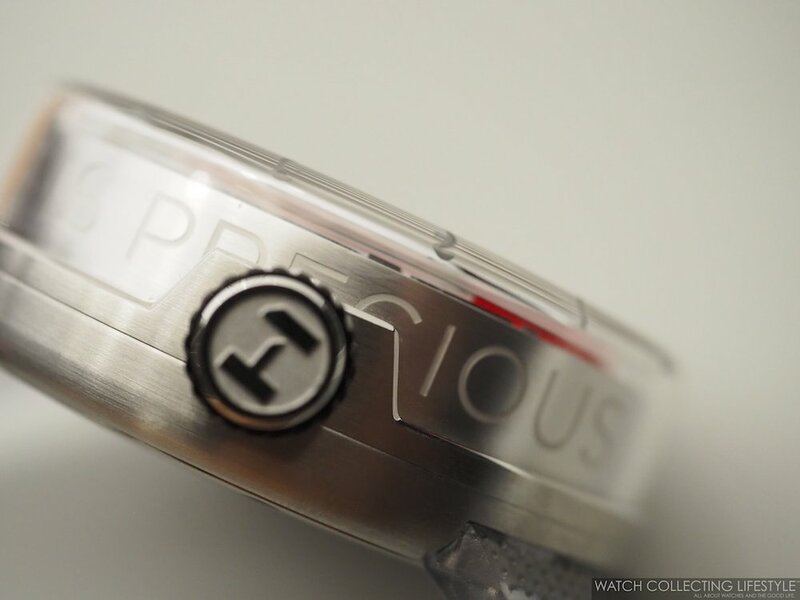 The watch measures 48.8 mm in diameter and 17.9 mm in thickness and is made of stainless steel. The H0 'Time is Precious' Edition is a beautiful reminder of time’s unstoppable flow, it is the stage for dramatic dialogues between art and science, innovation and craftsmanship, the now and its context. The dial is made of a fragmented monocrystalline silicon plate with laser cut marquetry. The stunning dial, comprising 63 mirrored facets, each lightly tilted at an angle, sets the scene for an essentially contemporary viewpoint. The ever-changing lighting effects, induced by human movement, continually allude to the present’s mobility, poised between the past and future. In this timepiece, modern esthetics and deep-rooted technical expertise convert an irreducible slice of life into a random kaleidoscope of our precious existence. Augmented by a futuristic design, the minutes can be read via a grey hand positioned in a subdial at 12 o'clock and the seconds this time via a small aperture with a rotating disc at 9 o'clock. The practical cutaway at 2 o'clock enables the power reserve level to be read as necessary, this time in a matching red color light the time fluid. The four cutaways are of different shapes and sizes to give a special effect to the dial and its broken mirror effect. The two bellows that act as the pulse of the red and clear liquids that trace time’s progress, a power reserve display and a disc showing the advancement of the seconds are all visible. On the profile of the case, the phrase ‘Time is Precious’ is delicately engraved in all caps. Three-dimensionality and reflection define the character of the H0 Time is Precious. The phrase is engraved front-on and in reversed mirror writing. Signing off allegiance to full transparency is a sapphire minute counter subdial and a clear rubber strap with deployant folding clasp. With a very prominent domed sapphire crystal with anti-reflective coating on the dial side, a screw-down crown and sapphire display case back, the HYT H0 'Time is Precious' is water resistant to 30 meters. Powering the new HYT H0 'Time is Precious' is the manual wound HYT calibre 101 with 35 jewels. The movement beats at a frequency of 28,800 to provide a power reserve of 65 hours. This amazing movement with HYT’s exclusive patented micro-fluidic module includes two multi-layer metal bellows, capillary tube in medical grade glass with interior nano-coating, two immiscible liquids —one transparent and the other colored with a highly resistant dye—, thermal compensator with dedicated bellows containing a special liquid and ceramic fluid restrictors. On the wrist, the new HYT H0 'Time is Precious' Edition wears true to its size and just like its siblings quite big and tall in terms of thickness. A stunning watch in person and priced right for this level of 'haute horlogerie' with an incredible and very unique look. The HYT H0 Time is Precious is available in a limited edition of only 50 pieces. Sticker Price $49,000 USD. For more info on HYT click here. Posted on February 12, 2019 by Editor & Publisher and filed under HYT and tagged Independents HYT H0 HYT Hydromechanical Watches hydromechanical hydrohorologists Independent Brands HYT Watches HYT HYT H0 'Time is Precious' HYT H0 Origin Most Popular.